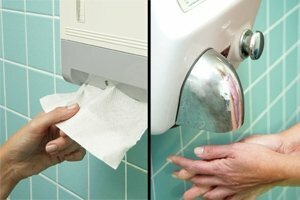 Scientists have worked out the best way to dry your hands and it appears that paper towels not only dry hands quicker than electric driers, they are also more hygienic. His review of 12 studies found that, overall, paper towels were “superior”. One study found they leave hands 96% dry after just ten seconds. After 15 seconds, the hands are 99% dry. “This can increase the number of germs by an astonishing 255 per cent,” said Keith Redway, senior academic in Microbiology and Molecular Biology at Westminster University. Cloth towel rolls were marked down because of the numbers of people using them. Keith Redway’s research has shown that disposable paper towels remove 58% of bugs and cotton roller-towels 45%. “The message has to be to wash and then dry your hands thoroughly, using paper towels, not the hot-air dryers,” explained Keith Redway.